Schedule Delays – To comply with The Americans with Disabilities Act, the Brinnon/Quilcene bus, on request, may deviate up to 3/4 of a mile from it’s regular route. Bus deviations are only allowed on adequate county roads and streets between SR-104 and Brinnon. Requests for this service may cause schedule delays. Snow conditions may cause interruptions to this service. For more information call 1-360-385-4777. 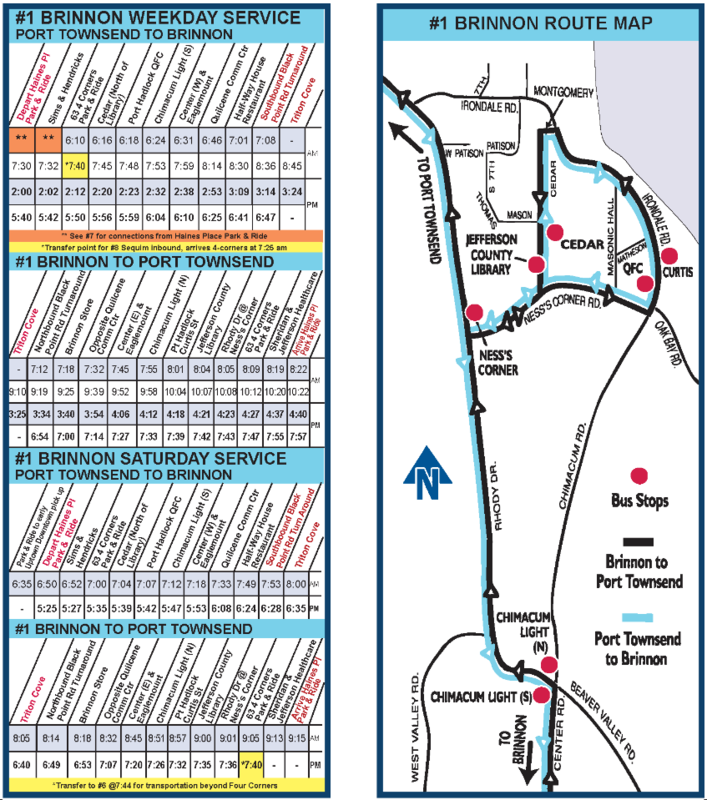 **For early AM commuter routes, the #7 Poulsbo bus will pick up passengers at the Haines Place Park & Ride at 5:59am. The #7 will connect to the #1 route at 63 Four Corners Park & Ride departing at 6:10 am.